Buster had surgery a few weeks ago and everything went super smooth. He adjusted right away to a new way of walking and the only thing he has struggled with is how to poop without rotating. Last night he suddenly has had his back leg give out on him. He will hop fine for a minute or so and then the leg gives out. He is 13, rear amp. I’m going to put a call into the surgeon, but is he just sore? Could being tired catch up with him this many weeks after surgery? Welcome and best wishes for Buster! Your future forum posts will not require moderation. He may indeed have overdone it. What type of exercise is he getting so early on in his recovery? FYI: Walks do not build strength, only endurance. Be sure to work in core conditioning, strengthening and stretching among very short walks at this point. There are various starter exercises in the Tripawds Blogs and Loving Life On Three Legs is filled with many more helpful rehab tips. Please consider calling a certified canine rehab vet/tech instead. They can provide a proper evaluation and recommended exercises to keep Buster fit and strong. 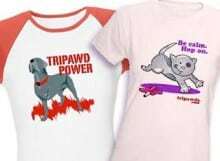 Visit a CCRT or CCRP and the Tripawds Foundation can even pay for your first visit from the Maggie Moo Fund for Tripawd Rehab. While you wait for comments from others, use the Advanced Search above to refine your forum search results with specific phrases, and you’re sure to find lots of helpful feedback. You can also search all blogs here . Or, consider downloading the Tripawds e-books for fast answers to common concerns and feel free to call the toll-free Tripawds Helpline anytime! Honestly he has only been getting short 5 minute walks 2 or 3 times a day to potty. My thought is he may have ventured off his padded runway around the house and taken a spill. I have a vet appt scheduled for tomorrow to rule out any hip or joint issues. Thanks for the links. What kind of dog is Buster? How big is he? In my experience it takes a few months to build strength after a rear amp. My first Tripug Maggie lost a rear leg to mast cell cancer- it took her about 6 months to work up to about half the activity level she had pre amp. But back then I didn’t know about strengthening the core muscles and all that and lets face it- she was 7.5 year old pug…not the most active of creatures! Maggie could hop just fine right after her amp but she tired very easily. Sometimes she would only hop a couple times then sit down. The other thing I would notice early on is that her back leg would tremble or wobble when she stood still for too long. I adopted my current rear amp pug mix about 2.5 months after she lost a back leg to a car accident. Elly was fully healed but had little strength or endurance. We built strength slowly using food puzzles and games, and balance exercises. After we took some classes we added trick and obedience training to our routine. It’s not a bad idea to get the knee and hip checked if you are concerned- did he have issues with that leg before the amp? Hopefully he just needs a little time and work to get stronger. BTW- Maggie had always had to rotate to poop too! She didn’t poop for several days after her amp- she would start spinning and fall down. Luckily for her she had her right back leg and always spun clockwise. On day 7 post amp she kept her balance and was able to spin and poop. Buster is about 72 lbs. The concern is he has been getting around fine. Now suddenly is acting like his back leg won’t support him. I am going to take him to the vet just to be safe. Hopefully nothing with his joints has gone bad already. Sorry to hear Buster’s having problems. I know how anxiety provoking it is when these things seem to come out of the blue. I agree that it makes sense to get his joints checked, but would think it is likely he has tweaked something or strained a muscle. The altered Tripawd gait makes them prone to such injuries, especially early on, before their body (all the muscles/tendons etc) has had time to adapt and build strength. My Meg, a front amp, also sailed through recovery, then suddenly about six months post amp, she suddenly started falling over. Her front leg just gave out. It was as though it couldn’t support her. I freaked completely, thought it was her elbow collapsing, but it turned out she had pulled a muscle behind her shoulder blade. I would strongly second Admin’s suggestion to go and see a rehab vet (as well as your regular vet). They will be able to assess the situation, and show you exercises etc. to help build Buster’s core strength. It may be that some acupuncture could help him too, and/or some hydro. A rehab vet will be able to advise. Meg is now more than two years post amp, and has never had a recurrence of her shoulder injury. We do a lot of core strength work at home, and still see the rehab vet every month or so, and this works well for us. Good luck. Do please keep us posted. Oh also, just to add… although it looks as though Buster’s leg is giving way, it could well be a strain or build up of tension in the muscles around his lower spine that is causing the problem. Just a thought. Do you think a puppy massage is in order? Lol. Thanks again all for the kind words a d advice. Just want to DITTO all the fine advice you’ve gotten and to send best wishes to Buster! AsClare said, sometimes what looks like a leg issue, it can really be a back, or even neck issue. What was reason for amp? And yes, do search “massage” here. Massages for tripawds do wonders. How a put range of motion? Are you able to gently bend and slightly stretch his leg without any tension? You might also ask about Rimadyl as he certainly could have a vitnof arthritis at his yiung age! Also check out some of the harnesses we suggest for tripawds in the Gear section. Some dogs take tp them roght away. Some, it takes a vit longer. I actually already have a harness from here that was suggested. Its the one with the brush guard, which makes me laugh because my truck has one of those! He has just sort of accepted that from time to time he is going to be airborne hoisted by it. I only just started using it when this problem came up so I could keep his rear end up when the leg wont. He is a rear amp due to cancer. He got plenty of puppy massages last night from neck to tail. We did some leg stretches and massaging. He has full range of motion with the leg. I did find a bump/knot between his spine and ribs. And massaged around that. He is losing strength less often this morning, and when he does it is now less dramatic with instant recovery. I am going to keep my vet visit today to check out the lump and rule out hip/ joint issues. That isn’t until 5:30. Update for everyone. Vet said they didn’t feel anything wrong with the leg. More than likely he just over did it. We put him in arthritis meds for 2 to 3 weeks, then we will take him off and see if it gets worse again to test I’d he needs to be on them permanently. On about week 3 our rear amp lab mix Miss Kitty started exhibiting what we, and the vets thought was hind leg weakness from sore muscles. To our chagrin, we found out that her Toe Grip was jammed up aginst the nail bed, causing excrutiating pain. Then at week 8 she started refusing to walk unless we completely supported her hind quarter with the harness. Just got back from the vet and her inside rear toe nail is split with the quick exposed. He trimmed the nail way back, recommended a boot and we all are hoping it will grow out normal and stop the pain. Poor baby. She’s already had antibiotics and Rimadyl for pain. So….if dogs refuse to walk, carefully check all nails for problems.